Add one Hi-Speed COM port to your PC, PDA or Palmtop PC. 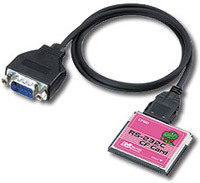 Attach Bar Code Scanners, Magnetic Stripe Card Readers, GPS Receivers or other RS232C devices. Supports Modems, ISDN Adapters, instruments devices and Biometric Sensors. Easy to use. Just Plug & Play. Works as a standard COM port on Windows XP/ 2000/ Me/ 98/ CE, Pocket PC 2000/ 2002/2003, Handheld PC 2000, and Windows Mobile 5.0. Bundled VB/VC sample source code and libraries allow you to built your own communication software. Ultra low power consumption allows a long battery life. CF Type II slot or PC card slot with CF Type II adapter. *The CF slot must support CF I/O function. *1 Can't execute <Create_file(Open COMx)> the third time after <Create_file Open COMx ---- Close COMx> process has been repeated twice.It causes some System Error. Start bit 1, Data bit 7/8, Parity bit Even/Odd/None, Stop bit 1/1.5/2. Weights CF Card : 10g. 0.35oz. Handheld PC 2000, and Windows Mobile 5.0. Electromagnetic Emissions Standards CE Mark, VCCI/FCC Part 15, Class B. · CF60U Serial I/O CF card. Communication program sample source code. * Covered and licensed by U.S.Patents 4,603,320 4,686,506 4,972.470. Microsoft Windows® and Windows Mobile® are registered trademarks of Microsoft Corporation in the U.S. and other countries. All other products, services, names and registered trademarks are trademarks of respective companies.